n addition to the basic 6 colors (CMYK, LC, LM) printing mode, it also possess many kinds of white ink printing mode, varnish printing workable too. Therefore, this high quality printing machine has sufficient capacity to produce special effects, such as 3D effect, relief effect, gradient effect etc. Equipped with simple but high-end RIP software, the image quality is superior, meeting the requirements of all industries. YD3216-RD flat bed printer adopts new grey level Ricoh Gen5 stainless steel print heads included internal heating system. Its feature of variable drop printing delivers the highest print resolution of 600X2400dpi, can clearly print 2pt font. The stable working performance and long lifetime give it the ability for 24 hours non-stop running. Adopting HIWIN mute double linear guide rail which is strong, low noise and durable for smooth moving of the car and stable printing. 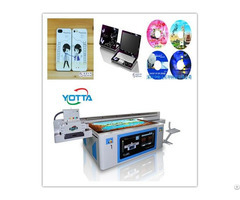 YOTTA UV printers use Dual-level precision screw rod for driving control, substantial increase in landing precision of ink, so as to avoid the emergence of color banding. The acrew rod is high-accurancy, low-noise and durable. 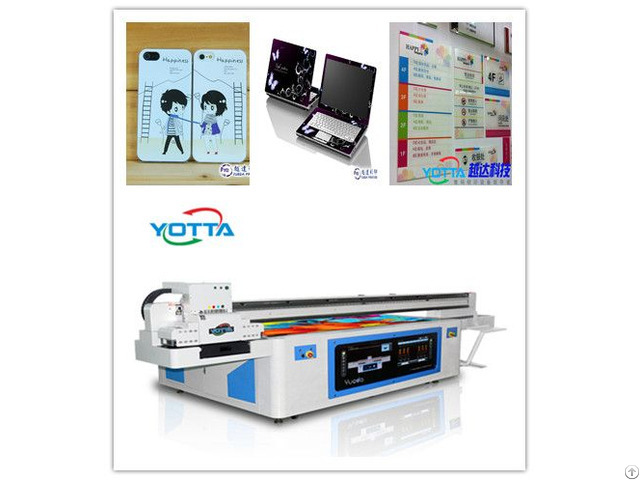 YD3216-RD printer has the function to measure the thickness of print materials, so as to ensure the accurancy, save time and labor, further to simplify your workflow and provide high efficiency. 5.Loading and unloading material device. Easy to put on and put down the large and overweight materials, labor-saving. The negative pressure system is to make the ink supply more smooth and well-distributed, to achieve excellent print results. This wide format UV printer can automatically recognize and to skip over the blank area of the images. 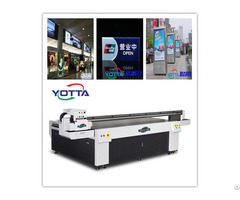 YOTTA flatbed printers direct print onto a variety of medias with optional inks: C, M, Y, K, LC, LM. White ink and varnish are allowed to help printing embossed, 3D and other effects.